In this experiment, I wanted to hook up a DHT11 temperature and humidity detector module to the Arduino Uno, and output the temp and humidity data to an LCD module. I’ve provided wiring diagrams, code and guidance below, in case anyone is curious. A bunch of connectors. If you have no female connectors, you can push the DHT11 straight into the breadboard and make connections from there. Next, to get the code for the DHT11 bits working, you need to grab and install a DHT11 library: http://playground.arduino.cc/Main/DHTLib which has a folder you will place into your Arduino/libraries folder. 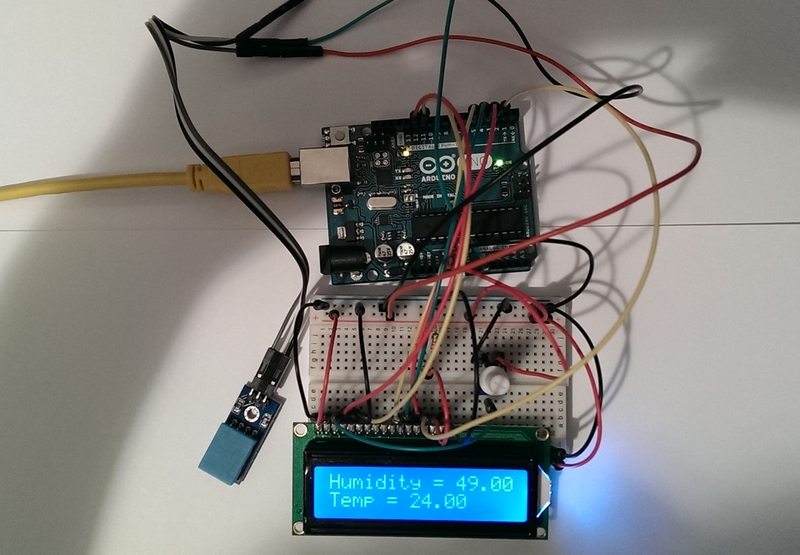 You should see the LCD displaying temperature and humidity data now. would love to see this with multi dht11 and a button to toggle between them. The compiler can’t find the dht.h library. You’ll need to check that the necessary files are present in your Arduino/libraries folder. You should see dht.cpp and dht.h in that folder. It works for me at once! Thanks a lot. Why don’t shows tempereture under 0 degres? Hello, I’m a beginner in Arduino so I wanted to try out some simple projects. I hooked up everything correctly, but I need help on ‘ grab and install a DHT11 library’ I went to the link but I couldn’t find out how to grab/install. Please help. You can get the files from here: https://github.com/RobTillaart/Arduino/tree/master/libraries/DHTlib — dht.cpp and dht.h are the important ones. Please help me someone i have a Potentiometer mono 50k and a Potentiometer mono 100k , which of the two is best to use it in the diagram above, or if none is good what specifications must have a potentiometer as the picture. uso da poco arduino, non so come si scarica la libreria, qualcuno può aiutarmi? Please admin or who made this project my display doesn’t start what is wrong , and please tell mel how i eliminate the potentiometer and i see in second picture are 2 wires missing like in first photo. 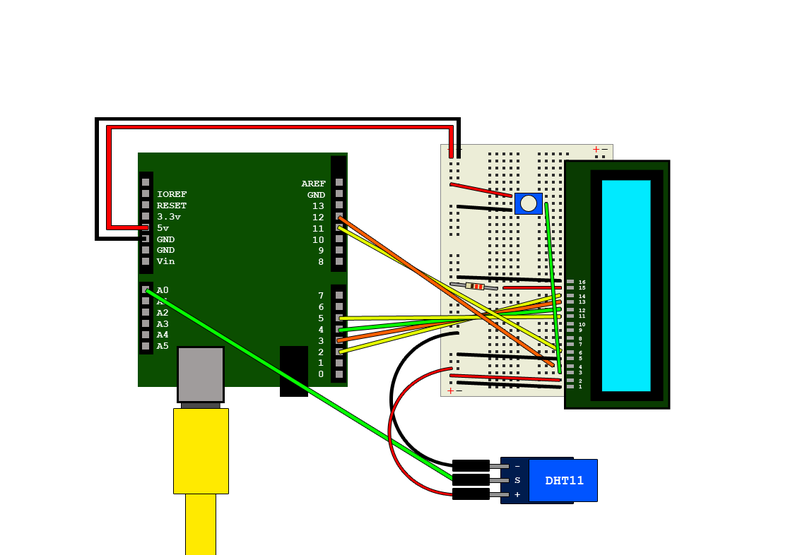 Please use something like fritzing to make your schematics.